This is definitely all of our favorite lunch. It's the lunch I've been making the longest -- indeed, I started making a version of this when I was pregnant with Elisabeth. It's the one we like to serve when we have friends over, or when we haven't been to the grocery store in weeks. It's comforting, it's nourishing, it's always available, and it's delicious. 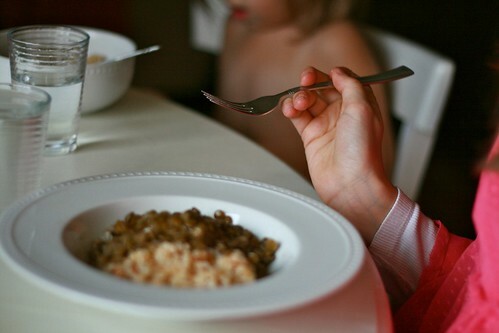 No matter what picky eater we have at the moment, they will all eat large bowlfuls of lentils and couscous. This is the kind of simple food that you can go back to again and again. It's simple, pretty quick, and doesn't contain much by way of seasoning. But simple, healthful foods like this don't require a lot of seasoning. I know I've photographed this meal on a number of occasions, meaning to share it with you here, but always something has interfered with that plan. So, here, tonight, I am finally sharing this with you. Thinly slice several cloves of garlic (3-4). You could mince, or press, or even use the jarred kind. 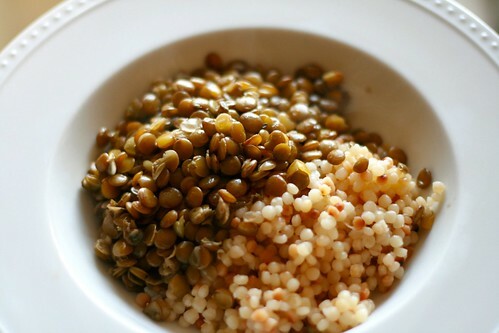 But the slices soften up so nicely and are so delicious and pretty as you eat the lentils. I really do recommend the slicing. Bring to a boil. 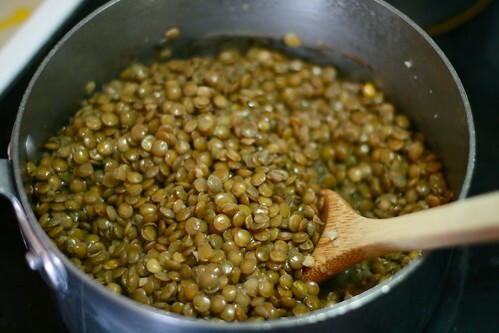 Reduce heat and simmer until the lentils are cooked but not mushy, about 25 minutes. A lot of the liquid will evaporate. That's OK, it's not meant to be soup. 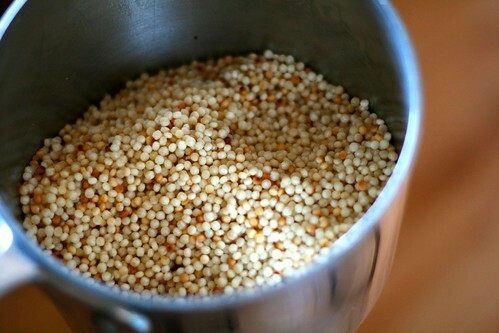 Meanwhile, prepare your pearl couscous (also called Israeli couscous or sometimes toasted couscous) according to package directions. I always toast it first, but of course you don't have to. Serve in bowls and enjoy a simple, satisfying lunch. Because that's what the very best of lunches are, don't you think? Simple, satisfying, sustaining. On the best of days, lunch is a moment for everyone to stop what they're doing and come together for a few minutes in the kitchen. Lunch can feel like a chore, I know. It often does to me, that's why I decided to do a lunch week! But if we remember to stop and savor it, it's also a gift and a blessing. Wishing you all a season of beautiful lunches.